Android Messages, may not be a name you have heard of, but one which you likely have on your phone already. Relax, it is not a new app, but the new name of Google Messenger. The Mountain View company has made the change out of the blue, and has not exactly announced why. The changelog for the Android app, says “ A new name! 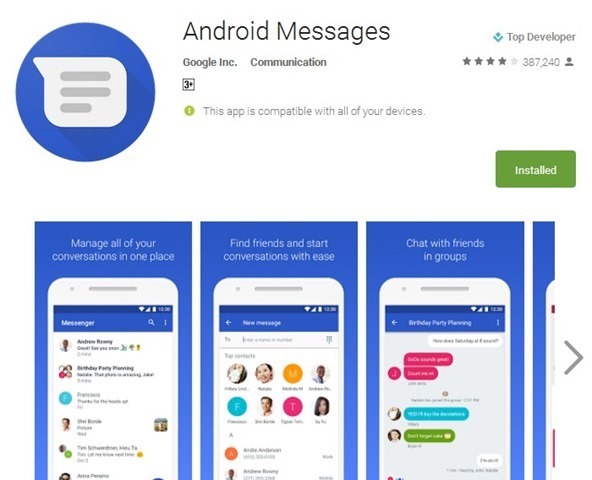 Messenger is now Android Messages, the messaging app built for Android”. This is likely because of the introduction of RCS (Rich Communication Services), in the app. The RCS technology is a smart messaging protocol which aims to replace SMS, with typing indicators, read receipts, multimedia sharing like WhatsApp, Telegram, and especially iMessage. Even the name Android Messages is quite similar to Apple’s messenger app. Android Messages will likely be the default messaging app on all future Android devices. The major issue is that the protocol is new, considering that RCS is yet to be adopted by the majority of carriers around the world. The same can be said about third party SMS apps as well. Some carriers have their own RCS apps too, for example Reliance Jio, which uses the same in its JioChat: Free Video Call & SMS app.